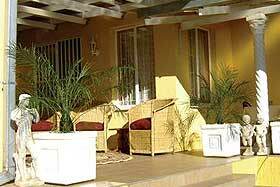 Elegant Comfort and Friendly Service: Close to all amenities, easy to locate in the quiet, upmarket part of Windhoek we offer accommodation with the typical warm hospitality of Africa. 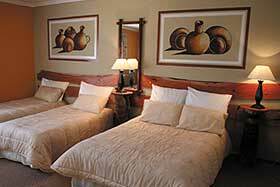 Equally suited for visitors, business travellers and families, we offer: 5 comfortable rooms each with TV and fridge, a sparkling pool and taxi service to and from town. 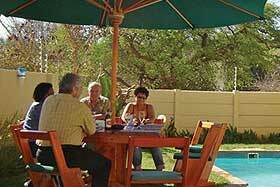 Location: Situated in Olympia, a southern suburb of Windhoek, next to a dry river with indigenous trees, birdlife and nature. Five minutes drive from the “Maerua Park Shopping and Entertainment Mall” and Windhoek Town, two minutes from the Woermann & Brock Supermarket, Liquor Store, Bodega Pizzeria, Chemist, Doctor etc. Accommodation: Bed and Continental Breakfast, 2 large Family Rooms (each 1 Double Bed and a Sleeper Couch) / 1 Double Room / 1 Twin Room / 1 Single Room - Large En-suite bathroom with shower and/or bath / Overhead Ceiling Fans / Coffee Kettle and Coffee / Tea / Fridge / Television with satellite channels (also German & Portuguese channels) / Family Rooms with direct access to pool area / Non-Smoking rooms available.